Aug. 22, 2016 -- The Physics and Engineering faculty greet our new freshman class. Our newest faculty member earned her Ph.D. from the University of California at Los Angeles. She did post-doctoral work at Purdue, UCLA, and in France. Dr. Milbury has experience with General Electric's nuclear electric generators. In addition, she worked on the Fermi Gamma Ray Space Telescope at the Santa Cruz Institute for Particle Physics. Dr. Milbury won the UCLA Department of Earth and Space Science Excellence in Teaching Award. She has given invited talks at Jet Propulsion Lab and the University of Texas. She has been interviewed by Sky and Telescope magazine. She has been active in the Women in Science programs at Purdue and UCLA. Dr. Milbury has also given science presentations at science museums and to children in elementary and middle schools. October 3, 2016 -- The NASA WV Space Grant Consortium has awarded NASA Fellowships to ten of our physics students. The announcement was made by Dr. Joseph Wiest, Professor of Physics, who also serves on the NASA Board. Dr. Wiest commented, "Awardees are paid to perform a research project. They are selected based on their academic record and their commitment to a discipline of interest to NASA." Sept.·15,·2016 -- Richard Clemens donated an 8-inch Schmidt Cassegrain telescope including computer control. 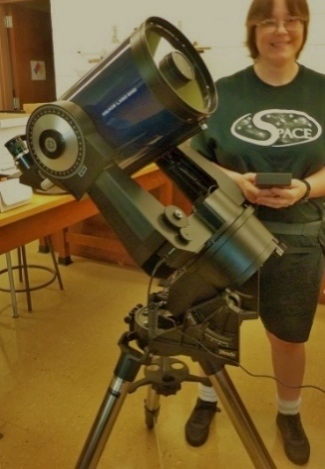 Dr. DeLaney enthused, "The telescope will be invaluable to our students as they learn to find objects in the night sky to show to willing campers. The accessories are amazing, especially the solar filter to show sunsport to students." Rich was Associate Professor of Business and Computer Science from 1977 until 2010. We thank Rich very much for his generosity. Dr. DeLaney is featured in the cover story of the fall issue of The Neuron journal. The article articulates the ways DeLaney is dedicated to challenging students to explore the unknown. DeLaney has two grants from the National Science Foundation's WV-EPSCoR program. Her radio-telescope grant involves consructing radio telescopes for studying hydrogen in the Milky Way and the Sun. In addition, she is part of West Virginia's $20 million NSF-EPSCoR Infrastructure Improvement Grant. She is involved in the Pulsar Search Collaboratory that trains students to study pulsar signals from the Green Bank telescope. The West Virginia Higher Education Policy Commission's Divison of Science and Research produces The Neuron, a quarterly publication that features science and research news primarily from WV colleges and universities. April 18, 2016 -- Chip Pickering (Class of 1978) took us to the roof of the library for a colloquium about his donation of 25 solar panels. He is President of Pickering Energy Solutions, an organization that launches and encourages renewable energy generation in the Parkersburg area. 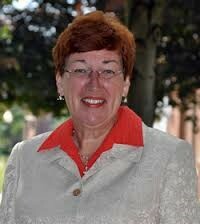 Pickering continues to serve as a member of Wesleyan's Board of Trustees. Sept. 23, 2016 -- Dr. Milbury traveled to the California Institute of Technology to speak on her updated research regarding the magnetic field and gravitational anomalies of Mars. Oct. 14, 2016 -- Dr. Sean McWilliams spoke on the recent discovery of gravitational waves. These are ripples in space-time produced when a very massive object suddenly slows down, speeds up, or changes direction. Gravitational waves are a key prediction of Einstein's 100-year-old theory of general relativity. Last year, gravitational waves were finally detected by astrophysicists at the Laser Interferometer Gravitational-Wave Observatory (LIGO) by measuring the orbital decay of binary pulsars. A pulsar is the rapidly rotating star-core left behind after the star explodes. McWilliams is a gravitational-wave astrophysicist at WVU who is a member of the LIGO team. Dillon·graduated·in 2014. He reports, "I am pursuing a Ph.D. in Biomedical Engineering in the Neural Systems Lab at the University of Kentucky. 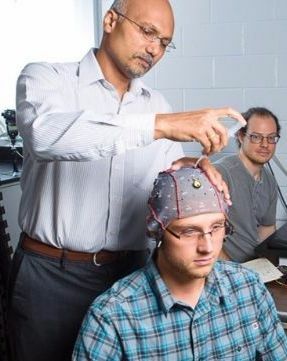 My research involves biological signal acquisition, signal processing, software development, and machine learning techniques for building computational models to characterize brain states from EEG data in real time. "Our models classify sleep stages in animals to track and alter sleep quality through noninvasive stimulation. 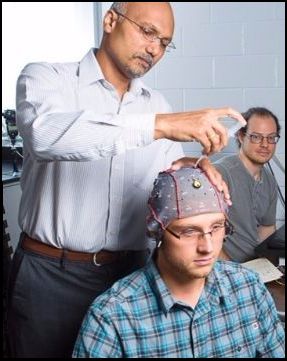 We also have projects involving brain-computer interfaces, for which I am designing a system to study somatosensory-evoked potentials in human EEGs. It's great work in a field that is undergoing a period of growth and innovation, and to see how your work translates to a clinical setting." Presentations by our students. Mark Leadingham, Chaos theory applied to pulsars: Chaos theory involves systems that are highly dependent on initial conditions. A seemingly insignificant difference in initial conditions will give a completely different outcome. Mark applied chaos theory to astronomical objects called pulsars. Becca Davis, Growth and strucutre of iron fluoride. 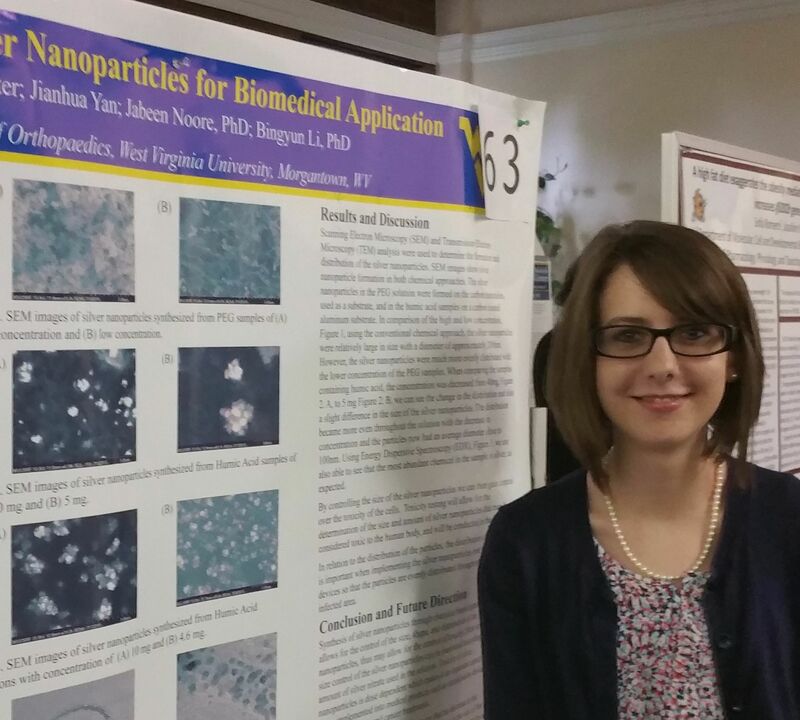 A report of summer research performed in WVU's NanoSafe program. Angela·Meyer's presentation at Space Day. April 16, 2016 -- Angela Meyer and Tyler Hefner attended the annual NASA Space Day meeting, this year at Fairmont State University. Angela gave a poster presentation on the small rocket payload that the club built. The payload will fly on board a sounding rocket to be launched into sapce at NASA Wallops Island in June as part of the RockSat-C program. Our payload uses an inertial measurement unit to sense the rocket's spinning motion. An Arduino microprocessor records the spin and then an H-bridge drives a small reactino motor at the same rate but in the opposite direction. This is an example of a reaction wheel, which is used to control the orientation of the payload. Rocket·launch. June 24, 2016 -- Angela Meyer and Olivia Rycroft spent a week at NASA Wallops Island. They worked with NASA engineers to install their payload on a Terrier Improved Orion sounding rocket. They watched the launch, retrieved the payload, and analyzed the data. Planning our new payload for 2017. 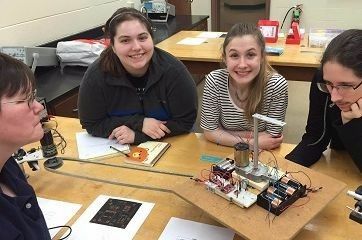 This year's project is to build a payload to record vibrations and temperatures during a trip into space. We have selected appropriate thermocouples and piezoelectric vibration sensors. We are designing the holders for the vibration sensors. We will wire the sensors into an Arduino microcontroller. SPOT training. Sept. 17, 2016 -- Angela Meyer and Mark Leadingham attended a training session for the Space Public Outreach Team at Green Bank. SPOT members are undergraduate student ambassadors who give science-themed presentations to K-12 students in West Virginia. Aug. 21, 2015 — The Physics and Engineering faculty greet our new freshmen class. Cody O'Meara and Corey Rhodes worked in during the summer (2015) at the National Institute of Standards and Technology in Gaithersburg, Md. Cody developed a standard for testing large-scale 3-D laser scanners. He designed experiments and manipulated results using laser software and Matlab. Corey studied atomic-force microscopes. An AFT is a high-resolutions device consisting of a sharp tip connected to a springlike cantilever. The tip scans across a material's surface to detect surface irregularites that can be as small as an atom. Corey tested sensitivity by connecting a charge-based capacitance measurement circuit to the AFM probe tip. March 15, 2015 — Members of the SPACE Club sponsored a tethered helium-filled balloon launch. They flew a payload consisting of a magnetic-field sensor, an accelerometer, a gyroscope, and a Geiger counter. They also tested a transceiver to received data from the payload in real time. Dr. Steven Hard came from NASA IV&V to advise. Students and faculty from Marshall University also participated. Andrew Tiffin, Eric Kramer, and Paul Mallory built the payload. 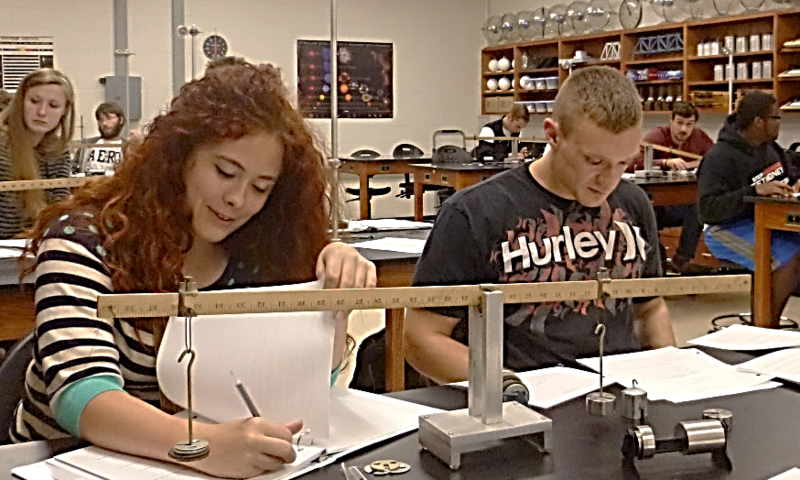 Sept. 22, 2015 — The NASA-WV Space Grant Consortium has awarded NASA Fellowships to ten of our physics students. The announcement was made by Dr. Joseph Wiest, Professor of Physics, who also serves as a member of the NASA Board. Dr. Wiest explained, "Awardees are paid to perform a research project. They are selected based on their academic record and their commitment to a discipline of interest to NASA." Tommy Brunswick works for U.S. Steel Logistics. He will soon be transferred from Philadelphia to their location in Marietta, Ohio. Josh Carter is pursuing an M.S. in Medical Physics at Duke University. Josh emailed Dr. Popson, "I just finished my second semester. I joined a research team several weeks ago and will be spending about half the summer here at Duke working on research. I will also be spending three weeks at Dr. Peter Sandwall's clinics in Cincinnati. Dr. Sandwall has been extremely helpful and accommodating. Thank you again for connecting me with Kate Turner, who gave me some great advice. It means a great deal to me how helpful the graduates of our program have been and I look forward to being able to return the favor!" Will George is pursuing a Ph.D. in Aerospace Engineering at Virginia Tech. "The resources here are incredible. I'm fortunate to be working with Dr. Todd Lowe, an expert in optics measurements and data analysis. We are starting a project with Pratt and Whitney that involves visualizing the flow intake of a full-scale engine using Large Field Particle Image Velocimetry." Josh Hiett is pursuing an M.S. in Aerospace Engineering at WVU. Taylor Price works at Mylan Pharmaceuticals in Morgantown. Matt Spicer is pursuing an M.S. in Mechanical Engineering at Virginia Tech. "I am taking classes in Vibrations, Controls Engineering, and Robotics / Mechatronics Lab, in which I've just built a snake robot." Matt Stadelman is pursuing an M.S. in Energy Systems Engineering at WVU. Matt also works at the National Energy Technology Lab in Morgantown. Colby Stanley is working toward an M.S. in Electrical and Computer Engineering at Duke. Andrew Tiffin is pursuing an M.S. in Mechanical Engineering at WVU. Oct. 13, 2015 — Adam Kuhl, who graduated in 1996, visited us during homecoming. Adam works at Raytheon as Principal Mechanical Engineer at the Hardware Engineering Center in El Segundo, Calif. Adam's specialization is electronic package and interconnections. Adam's projects typically require that he meet strict weight limitations. During Adam's 17 years with Raytheon, he has worked on many projects. For example, the Next Generation Jammer project involved a pod that is attached to the underside of a Navy aircraft with electronics that disrupts enemy-threat radar. The JLENS project used tethered blimps to provide long-term surveillence of high security assets. March 27, 2015 — Will George, Mark Mattis, Andrew Tiffin, Matt Spicer, Colby Stanley, and Josh Carter presented their senior research today. Dillon Huffman, who graduated in 2014, emailed Dr. Popson. "I'm working toward a Ph.D. in Biomedical Engineering at the University of Kentucky in the Neural Systems Lab. My research involves brain state detection and modulation. "We are developing methods of detecting and modulating sleep in animal models using electrophysiological signals. We are also using noninvasive peripheral nerve stimulation to reactivate motor pathways in human subjects having incomplete spinal-cord injury. Evan Gorman had a summer internship with Shalewater Solutions. The Clarksburg company uses chemical methods to treat water from petroleum-well-drilling sites. Evan worked on methods to remove radium from the water. His mentor was Ryan Hall. Wyatt Strickler worked at PDC Energy in Marietta, Ohio. Wyatt's project involved reclaiming an undeveloped potential natural-gas-well site. Ryan Holcomb worked at TransEnergy in St. Marys. Ryan monitored natural-gas-production data and graphed production curves. During the summer of 2015, the college converted the large classroom on Christopher Hall's first floor into a new state-of-the-art physics lab. The new lab is heavily used — this semester, we are teaching eight lab sections in this lab. Funding was provided by the college's U.S. Department of Education's Title III grant. Amelia·Riley·had an internship involving carbon nanotubes. Their molecular structure is a hollow cylinder with walls consisting of a one-atom-thick sheet of carbon atoms. This allotrope of carbon has unusual mechanical, thermal, and electrical properties. Amelia adds, "To perform my research, I had to become certified to operate the electron microscope at the WV Shared Research Facility. I analyzed basic nanotubes, boron-doped nanotubes, and nitrogen-doped nanotubes." Paige·Rutter·worked with silver nanoparticles, which have antimicrobial properties that make them a candidate for using in orthopedic equipment. 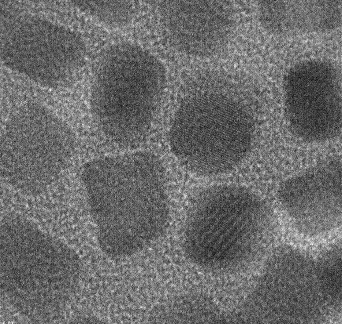 When silver nanoparticles are put into the cement at a joint replacement, the result could potentially be lower infection rates and quicker healing. Paige investigated the correlation of particle size to toxicity. Funding was provided by WV-IMBRE. Lauren Cronise had a biomedical internship with Dr. Christopher Kolanko. Lauren reports, "I worked to prepare an optical scanning device for clinical trials. The device was created by Eyemarker Systems to be a pupilmeter to detect exposure to chemical warface agents. The military plans to use the device for rapid diagnosis of exposure by using the pupil as a marker. I coordinated the project with BAE Systems and performed the MatLab programming for using the device." Ryder Bolin used a Guralp seismometer to map underground rock layers. He also built a remote-control vehicle to travel through pipelines to check for corrosion and leaks. (See photo below on right.) The NASA-WV Space Grant Consortium provided funding for both Ryder and Andrew's projects. December 19, 2014 — Today we received $50,000 from Dominion resources to purchase laboratory equipment. We will buy a seismometer and geophones, which give information on deep rock layers using reflected sound waves traveling underground. We are also purchasing a Raman spectrometer, a nuclear spectrometer, and an X-ray spectrometer. Arnold was Physics/Engineering technician for 35 years until he retired in 2000. He also managed the Wesleyan radio station. When Arnold first started working here, his first assignment was to repair the Physics Department's computer, which had 2000 vacuum tubes. Arnold also built much of the instrumentation in the display case. Aug. 10, 2015 — The National Science Foundation awarded Dr. DeLaney $11,600 annually for five years to study gravitational-wave astrophysics. The funding included money for internships for two students. Gravitational waves are ripples in space-time produced when a very massive object suddenly speeds up, slows down, or changes direction. Dr. DeLaney and her students will work with astronomers at WVU and the Green Bank National Radio Astronomical Observatory. They will perform follow-up observations using other telescopes, such as the Very Large Array and the Chandra X-ray Observatory. And they will develop computer algorithms to search for gravitational waves. Sept. 29, 2015 — Corey Rhodes and Cody O'Meara spoke about their summer internships at the National Institute of Standards and Technology. Corey worked on atomic force microscope circuitry in NIST's Physical Measurements Lab. Cody worked on three-dimensional laser scanners in the Dimensional Metrology Lab. October 13, 2015 — When a small change occurs in a complex engineering system, there can be far-reaching effects. Tonight's colloquium dealt with methods to deal with such issues. These methods are also useful when dealing with complex non-technical issues. Mr. Lindeman is a systems engineer at NASA-Marshall. Thomas Bartleman (2013) works at Aperia Technologies in California. Thomas emails, "My work includes data analysis, presentations of our pilot projects, new user manuals, warranty processes, and installations for high-end users." Chera Rogers Gainer (2012) is a Medical Physicist at Huntington Medical Physics. Kate Turner (2011) has completed her M.S. in Medical Physics at Duke. "I have entered the Air Force in California. My duties include mammography and Radiation Safety Officer. I have passed Board Certification Test Part 1." Dustin Schilpp (2005) is Project Manager at Sabra, Wang & Associates, a civil engineering firm in Columbia, Md. "I just completed ten years with my firm. I manage the structural condition inspection department. Six additional full-time engineers work in my department. We mainly perform bridge inspections, load ratings, bridge repairs, and rehabilitation design." Peter Sandwall (2005): "I have earned Board Certification in Medical Physics and have been promoted to Chief Medical Physicist at the Tri-Health Institute in Cincinnati. I have three medical physicists, three dosimetrists, and three cancer centers under my leadership." The Physics and Engineering faculty greet our 2014 freshmen in August. 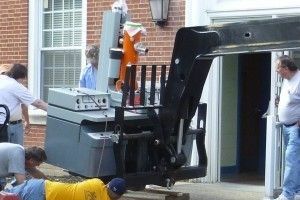 Last May, Dr. Wiest, Dr. DeLaney, and Dr. Popson drove a U-Haul to Marshall University to transport a surplus electron microscope that we purchased from them. In the photo, Dr. DeLaney is supervising the forklift operator, a skill she learned while she was in the Army. This summer, Josh Hiett traveled a short distance to NASA's Fairmont location (Interstate 79 exit 132). He worked on improvements to the user interface of the Rover-X, which is the four-wheeled all-terrain vehicle developed by the Robotics Capabilities Team at NASA IV&V. Josh was also a participant in the RockSat-C program. 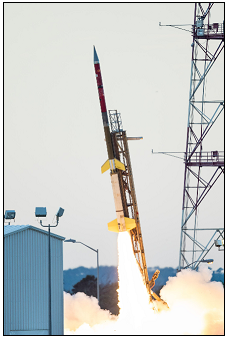 Participants traveled to the NASA-Wallops Island Flight facility for the launching of a sounding rocket that carried several experiments, including Josh's experiment to measure Earth's magnetic field. On June 26 at 7:21 AM, the suborbital two-stage Terrier Improved Orion rocket was successfully launched to an altitude of 120 km. October 11 — Do you remember building paper airplanes or designing bottle rockets in elementary school? Today we invited local students K-12 (and older) to do just that. 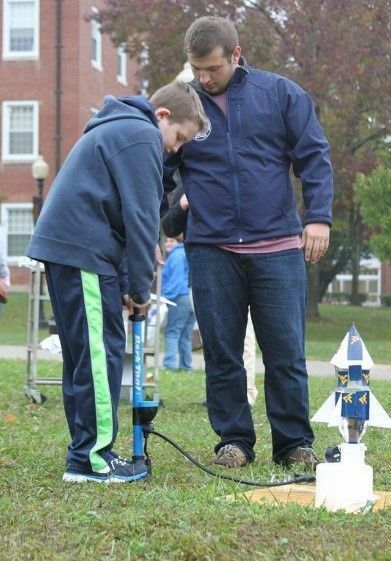 The event was organized by the SPACE Club, with support from the NASA-WV Space Grant Consortium. The event began with President Balch giving a warm welcome to participants. The WVU Assistant Dean of Engineering gave a presentation, Trends in Engineering. College students from all around West Virginia displayed posters of their NASA research. NASA-WV Director Dr. Majid Jaredi presented Josh Hiett with an award for his poster. Scientific exhibits included a planetarium show, catapults, and The science behind Zip lines. Dr. Steven Hard from NASA IV&V gave a luncheon presentation. The bottle-rocket and paper-airplane competitions were held in the afternoon. September 15, 2014 — The U.S. Department of Education announced that Wesleyan has been approved for a $10 million Title III grant under the department's Strengthening Institutions Program. The grant, to be distributed over five years, is the largest award Wesleyan has ever received. A new physics lab will be constructed with part of this year's money. This wonderful new lab will replace the large classroom on Christopher Hall's first floor. Students will be using the new lab when classes start in the Fall Semester. "Receiving news of this type is the dream of every college president in the U.S.," stated President Balch. "This is truly a transformational award. It will allow us to hire additional staff, bring all of our classrooms into the 21st century with state-of-the-art technology, and invest in faculty development — all designed to improve student success. Christopher Hall is visible to the right of Wesley Chapel. February 5, 2014 — Dr. Tom Damiani (1997) returned to his alma mater to give a talk on his work at the Bechtel-Bettis Atomic Power Laboratory near Pittsburgh. Tom earned his Ph.D. in Mechanical Engineering from WVU. He designs nuclear propulsion systems for submarines and aircraft carriers. He encouraged students to apply for summer internships at Bechtel-Bettis.